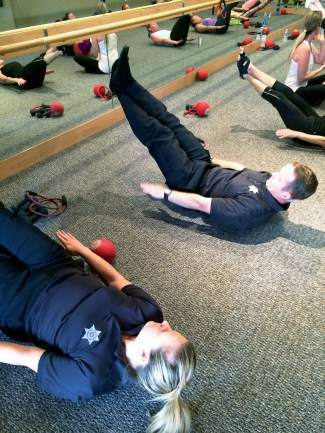 Jessica Tice and Daric Harvey, of the Vail Police Department, took to the mat at Pure Barre on Friday to raise funds for the Bright Future Foundation, which focuses on prevention and intervention of domestic violence. The Bright Future Foundation crew is raising money and has a matching funds goal through this week in the Stronger Me, Stronger We Challenge. Funds raised will be matched by an anonymous donor up to $2000! There are several ways that you can help us reach our goal. Today at 4:15 p.m. there is a class to support Bright Future Foundation at Pure Barre, 0216 Main St., Unit C-103, Edwards. The cost is $15 per person. The class can be taken by men or women and Daric Harvey will lead the charge. Wear comfortable clothes and you must wear socks. If you are not able to join us, you can contribute by visiting www.crowdrise.com/purebarrevailvalley/fundraiser/sherimintz and making a donation.